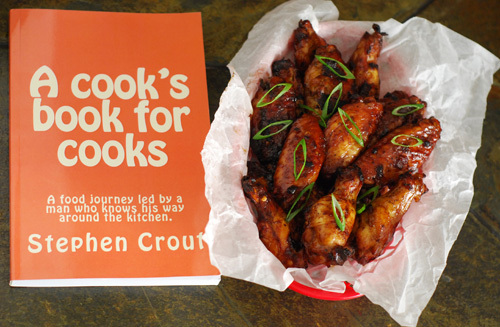 Recently, fellow blogger, Stephen Crout published his book A Cook's Book For Cooks. You'll notice it doesn't say "cookbook". That's because while it does have recipes, it's not your same ol' same ol' cook book. It's more conversational than instructional. Some of the recipes are structured in recipe format while others may just be narrative and both work. There is a membrane on the back side which some people* insist needs to be removed. It's a little difficult to do and after a brief try I just said screw it. It won't hurt if you are a bit more persistent than I was (56). Mix the mirin, soy sauce, sesame oil, half the onion, roasted red pepper and black pepper together. "Marinate the wings in this for one day. Don't have a day? Fine, go for an hour (Crout 75)." Set up your grill for indirect heat and preheat it to 375f. This will be fire roasting instead of direct grilling. Remove wings from marinade (reserve marinade) and fire roast them for 30 minutes. Flip wings and roast another 20 minutes. Meanwhile, put marinade in a preheated saute pan over medium high heat. Rapidly simmer for at least 5 minutes. Stir in sweet Asian chili sauce. 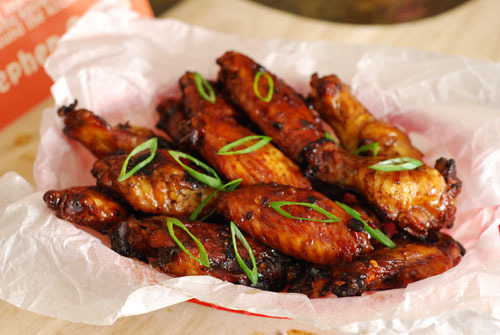 Toss wings in the sauce and return to the grill for 10 minutes. Remove, garnish with remaining green onion, and serve. The book gives bake/broil method for doing this inside. I'd tell you what it is but then I'd have to pay Stephen royalties. Go buy the book, it's only $10.99. Wing tip: When placing wings on a grill, place their cut/open side down first. This will help the rendered fat drip off/out easier. Can't remember who I got that tip from but it works. [Standard Disclaimer] Stephen Crout Industries, Inc paid me one kajillion dollars to write this review. Just kidding I paid full price and received no compensation. There, happy FTC?